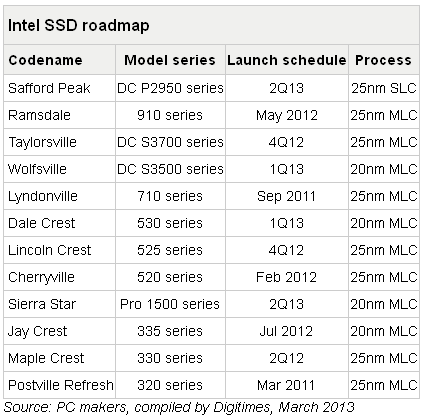 According to the publication Digitimes, Intel plans in April or May of this year to release several new models of SSD-drives for use in a corporate environment, or data centers. Previously, Intel has produced high-performance SSD-drives, but new items will have a lower cost compared to previous generations of SSD. According to unofficial information, Intel in April-May this year, will provide a family of SSD-product DC P2950, ​​targeted for use in data centers, and later – the family of SSD-drives Intel Pro 1500 for enterprise applications and for use in high-performance PCs. It is expected that the P2950 will be based on 25-nanometer technology and single-level cells, whereas the Pro 1500 – a 20-nm process technology and multi-level cells. It is expected that the 1500 Pro will be available in four models – the 350, 240, 180, and 80 GB, and in the third quarter, it will be added the 480 GB model. At the end of the year, Intel plans to release a more advanced model Pro 2500.